2:56pm: In addition to the previously reported moves, the Twins announced that they’ve optioned lefty Adalberto Mejia to Triple-A. More interesting, though, is the fact that they’ve reinstated Byron Buxton from his rehab assignment and also optioned him to Rochester. That means that two of the centerpieces of the Twins’ young core — Sano and Buxton — have both been optioned to the minors just one season after seemingly establishing themselves at the big league level. It’s been a tough season for Buxton, admittedly. The 24-year-old went on the disabled list early in the season due to a severe bout of migraines — similar to the issue that sent New York’s Brandon Drury to the DL. While playing on a minor league rehab assignment from that issue, Buxton fouled a ball into his foot and sustained a broken big toe. The Twins made the curious decision to bring him back a couple of weeks later despite the fact that the toe was still healing and without sending him back out on a rehab assignment. Perhaps unsurprisingly, Buxton was dreadful at the plate under those circumstances; in 51 plate appearances between DL stints, he hit just .122/.140/.163. Buxton has yet to find his swing in Rochester, albeit through just 11 games on a new rehab assignment. But the extent of his struggles, after a prolonged development period in which there were doubts he’d ever realize the potential he showed last season, have to be of fairly significant concern — especially when juxtaposed with the struggles of Sano to this point in the season as well. Given the fact that Minnesota has received no on-field value from the combination of Sano, Buxton and still-rehabbing righty Ervin Santana, it’s not exactly surprising that the Twins are nine games back from the Indians in the AL Central division. 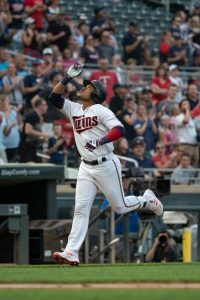 2:32pm: The Twins are set to reinstate Jorge Polanco from his 80-game suspension following a failed PED test, as La Velle E. Neal III of the Minneapolis Star Tribune writes. Mike Berardino of the St. Paul Pioneer Press reported earlier today that righty Zack Littell would also be returning to the Majors and will work in a relief role for the time being (Twitter link). In order to clear a spot on what is currently a full 40-man roster to accommodate Polanco’s activation, the Twins are set to designate outfielder Ryan LaMarre for assignment, Neal further reports (via Twitter). They’ll need to make a second move to recall Littell. Polanco, 25 on Thursday, was expected to serve as the Twins’ everyday shortstop after a strong second-half showing in 2017. The former top 100 prospect got off to a poor start to the season last year but slashed .316/.377/.553 with 10 homers, 15 doubles and a pair of triples in his final 234 plate appearances in August and September. Polanco was plagued by a dismal .239 BABIP through the first four months of the 2017 season, and his improvement in the final two months correlates nicely with a fairly significant drop in his chase rate on pitches out of the strike zone. However, an 80-game suspension fresh off a breakout finish to the season will undoubtedly lead to plenty of skeptics about his ability to maintain that output. He’ll hope to retake an everyday role in the Twins’ infield and prove that he’s able to repeat that output moving forward. With Miguel Sano still in the minors following a terrible run to open the season, there should be ample opportunity for Polanco to earn his way back into the lineup. Minnesota has been relying on Eduardo Escobar at third base with Sano in Fort Myers, and while Ehire Adrianza has been a surprisingly productive hitter of late, he’s a soon-to-be 29-year-old defensive specialist without much of a track record of offense. Polanco should figure into the mix prominently in the early going from his return. And, depending on whether the Twins are able to right the ship over the next four weeks, further at-bats could become all the easier to come by; both Escobar and Brian Dozier are free agents at season’s end. As for LaMarre, the 30-year-old has batted .263/.321/.313 through 109 plate appearances with Minnesota, logging plenty of time in center field with Byron Buxton on the shelf. LaMarre has fanned at a 30.3 percent clip in the Majors, however, and he’s currently in Triple-A Rochester despite the fact that Buxton is not yet back from his rehab assignment. LaMarre joined the Twins on a minor league pact this winter and served as a useful depth piece given the minor league options he had remaining, so the Twins likely would prefer to see him clear waivers and remain in the organization. Having previously been outrighted, though, LaMarre will have the option of electing free agency even if he does clear waivers. “The substance that I requested from my athletic trainer in the Dominican Republic and consented to take was a combination of vitamin B12 and an iron supplement, something that is not unusual or illegal for professional athletes to take. Unfortunately, what I was given was not that supplement and I take full responsibility for what is in my body,” said Polanco, who added that he’d like to fight the punishment, but he’ll avoid doing it in the best interest of the Twins organization. This is a tough late-spring development for Minnesota, a playoff hopeful that had the 24-year-old Polanco penciled in as its starting shortstop. Polanco filled that role in 2017 for the playoff-bound Twins and accounted for 1.6 fWAR across 544 plate appearances during his first full season in the majors. The switch-hitter batted .256/.313/.410 with 13 home runs and 13 stolen bases on the offensive side, and he posted minus-1 DRS and minus-4.3 UZR as a defender. With Polanco set to miss half the season, the Twins are likely to give short to Eduardo Escobar, while Ehire Adrianza will act as his main backup and minor league signing/experienced veteran Erick Aybar could also make the team, per Bollinger. Additionally, the Twins have 22-year-old middle infielder Nick Gordon, who ranks as MLB.com’s 80th-best prospect, but it doesn’t seem they’ll turn to him yet. The Twins are set to promote top infield prospect Jorge Polanco to the Majors, a source tells Darren Wolfson of 1500 ESPN (Twitter link). It appears that third baseman Trevor Plouffe, who left yesterday’s game with an intercostal strain, is likely heading to the disabled list, thus necessitating the move. Polanco is one of the more highly regarded infield prospects in baseball, ranking 66th on Keith Law’s preseason Top 100 list at ESPN, 95th on MLB.com’s Top 100 and 99th on Baseball America’s Top 100. Polanco has played shortstop in the minors but is said to be best suited for second or third base. The switch-hitting Polanco draws praise for above-average speed, very good contact skills and modest pop, with Law writing that he could hit 12-15 homers and be a defensive asset at second or third. The promotion is likely to be temporary, as Plouffe, Eduardo Escobar and Brian Dozier line up at third base, shortstop and second base respectively. The Twins have Eduardo Nunez and Danny Santana (who is currently on the DL himself and, notably, is out of minor league options) as utility options. Injured closer Glen Perkins tells 1500 ESPN’s Phil Mackey that a second opinion confirmed that he won’t require surgery to repair his ailing shoulder, but he’s still “at least” a few weeks away from pitching (Twitter link). Considering the fact that Perkins would need a rehab assignment after a lengthy layoff, that would seem to suggest that he could be out until early May at the earliest, and a lengthier absence sounds possible based on that timeline as well. Right-hander Kevin Jepsen is filling in for Perkins in the ninth inning, as I mentioned earlier today when looking at some bullpen shakeups that could have an impact on some players’ salaries in arbitration and free agency. Outfielder David Murphy can opt out of his contract with the Twins on May 1st, Mike Berardino of the St. Paul Pioneer-Press reports on Twitter. The veteran came to the organization on a minor league deal with hopes of a quick call-up, and it seems that the contract’s out clause was designed to give him some leverage in that regard. Murphy has said he has little interest in a lengthy minor league stint, and he could seek another opportunity elsewhere if he’s not on the MLB roster in two weeks’ time.